Of course, we can't avoid all toxins in the environment, but we can minimize exposure. Two things I'm trying to avoid on product labels are parabens (which mimic estrogen in the body and can make girls develop sexually too early and improperly and can harm boys' development) and "fragrance" (that mysterious ingredient found in all kinds of women's products, which is believed to cause birth defects). It's easy to find less toxic products at specialty health stores, but it's nice to find inexpensive products that I can grab on my weekly trip to the supermarket, too. 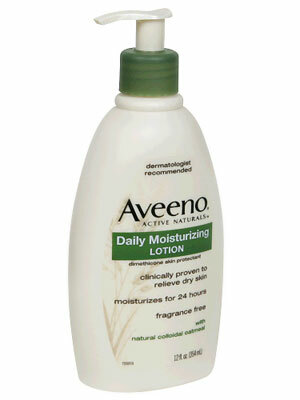 Aveeno Daily Moisturizing Lotion is good for someone whose skin tends to be dry, like mine. Better yet, I found an off-brand (Meijer Elements) that's cheaper, with the same ingredient list. What are your favorite clean, healthy products? Good for dry skin: Joyoba Oil or Almond Oil. Get it from a health store (almond oil you can sometimes find in health food stores); you can use it as a bath oil, too, or mix it with some sea salt for an all-natural scrub. If you want to be fancy, add some dried lavender leaves to the scrub, or lemon zests or similar (but then you have to use it up faster, or it goes bad). Sweet almond oil is BOMB! I love it. Sugar scrubs are great, because the sugar dissolves a little easier than the sea salt and isn't as abrasive. I also like olive oil for dryness or honey for chapped lips. You know my old TC hook up allowed for wonderful baths with Tazo Earl Grey tea bags. I love the bergamont oil smell! Aveno is excellent, stoopid good. My mom recommends a beer rinse for hair with great body, no gel, no artificial fragrance. She says that the smell evaporates but I beg to differ. I just generally avoid beer. BTW what the hell are you going to do when I go to MI and bring my litres and litres of perfume and perfumey lotions/shampoos bla bla blas with me? Ooooh, good suggestions, Tessa and Esperanza! All of them delicious. E: When you come to Michigan with your buckets of products, I will just have to refrain from slathering them on myself! Sorry Baby G. You'll have to wait until you're old for tia Esperanza's unique over-perfumization. hey, it is really easy and relativily inexpensive to make your own products. I make our lotion and shampoo. Check out Rosemary Gladstar's herbals for directions and ingredients. Good luck! I never knew that about parabens or that "fragrance" is believed to cause birth defects. Good for you for taking such good care of Baby G! Oh, I didn't know about any of that when I was pregnant - I was worried about all the food stuff, though. I've never dyed my hair in my life, so I guess that wasn't a problem! My favorite FAVORITE skin care stuff is Cetaphil. It's fragrance free and gentle. Did you get my email with Cinders in it? Kali: That's a great idea! I'm too tired to do anything except eat right now, but I'm usually interested in learning new DIY stuff. Susan and Michelle: I've been learning a lot, especially since everyone keeps forwarding me studies when some chemical turns out to be harmful. It's strange to become suddenly aware of so many toxins and dangers in pregnancy! Of course, some exposure to all this stuff probably won't hurt, or else all babies born in the US would have problems. But I'm trying to err on the side of caution with the knowledge that I have. Janet, don't feel guilty for not worrying! LOL. It's good to be informed about risks and benefits, but there are many ways to be healthy and responsible. Nobody has to do every little thing.